AT&T is set to become the first U.S. carrier to ship Windows Phone 8 devices, as three new handsets start arriving in stores Friday. The carrier made the announcement Tuesday that Windows Phone 8 fans have been waiting for, confirming price and availability for three models coming this month. First out of the gate is Nokia's highly-anticipated Lumia 920, available in red, white, black, yellow or cyan for only $99.99 with a two-year agreement. AT&T is throwing in a wireless charging plate free of charge to sweeten the deal. 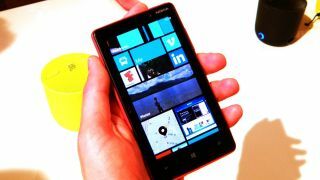 If the Lumia 920 is too much smartphone for you to handle, the carrier is also offering the budget-minded Lumia 820 for a mere $49.99 with two-year agreement as well. While both Nokia devices will be available for pre-order starting Wednesday and in stores two days later, AT&T is also offering a third HTC-branded handset to arrive just before Thanksgiving. Windows Phone 8X by HTC will be available in two models: California Blue with 16GB of storage for $199.99, or an AT&T-exclusive 8GB model in California Blue or Limelight (yellow) for $99.99 with a two-year agreement. "Our Windows Phone portfolio features the best designs for the fantastic experience of Windows Phone 8," said Jeff Bradley, senior vice president, Devices and Developer Services, AT&T Mobility in a press release. "Combine that with very exciting prices and our customers have lots of good reasons to choose Windows Phone this holiday season."